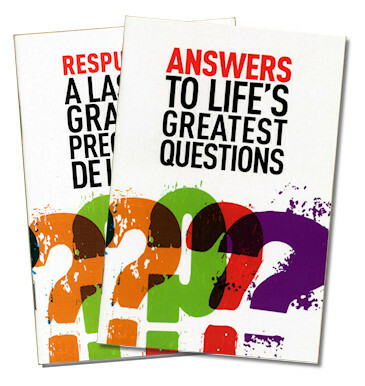 Answers to Life’s Greatest Question is a 32 page booklet that mirrors the questions and answers found on this website. At 4″ x 6″ it easily fits into a pocket or purse. Sold in packs of 10, 25 or 50. Contact us to order booklets for as little as $.77 each when purchased in amounts greater than 500. Includes free shipping via USPS Library Mail. Includes free shipping from Virginia via USPS Library Mail. Orders over 500 include custom back cover (This can include organization’s logo, address, web page, and contact information.) and must be ordered by calling 804-744-8300.